Kukla, Fran and Ollie was the first children's show to be equally popular with children and adults. The show's immense popularity stemmed from its simplicity, gentle fun and frolic and adult wit. Burr Tillstrom's Kuklapolitan Players differed from typical puppets in that the humor derived from satire and sophisticated wit rather than slapstick comedy. At the height of the show's popularity, the cast received 15,000 letters a day, and its ratings were comparable to shows featuring Milton Berle and Ed Sullivan. The basic format of the show was simple: Fran Allison stood in front of a small stage and interacted with the characters. The format was derived from the puppet act Tillstrom performed for the RCA Victor exhibit at the 1939 New York World's Fair. Acting as an entr'acte for another marionette show at the World's Fair, Kukla and Ollie would comment on the activities, sometimes heckle the announcer, and coax the actresses and models acting as spokespersons for the exhibit to come up onto the stage and talk with them. Never working from a written script, Tillstrom improvised over 2,000 performances at the Fair, each one different because of his personal dislike of routine. During World War II, Tillstrom and his Kuklapolitan Players performed in USO shows, at army hospitals, and for bond drives, where he met radio personality Fran Allison. In 1947, the majority of television sets were located in taverns and saloons. Network executives were looking for a television show that could be watched at home and decided the Kuklapolitans would be the perfect "family fare". The group was contracted for 13 weeks on daytime TV and stayed for the next ten years. The first episodes were aired daily from 4:00 to 5:00 in the afternoon on local Chicago television station WBKB, which was later acquired by NBC. When the network completed its New York-Chicago transmission lines in 1948, Kukla, Fran and Ollie began to air nationwide. By its second season, the growing adult audience prompted the network to move the show to a 7:00 P.M. half-hour time slot. By its third season, the show had six million viewers. In 1951, NBC cut the half-hour format to fifteen minutes, which, ironically, caused the ratings to soar even higher because audiences craved more of their favorite characters. After several seasons, the daily program was shifted to a weekly program on Sunday afternoons. When the series switched from NBC to ABC in 1954, it returned to a daily broadcast. When the series was canceled in 1957, it was one of the longest running programs on television, second only to Kraft Television Theatre. With few exceptions (e.g., elaborately staged versions of The Mikado and an original operetta of St. George and the Dragon), all of the shows were improvised. Pre-show preparation consisted of a meeting between Tillstrom, Allison, director Lewis Gomavitz, musical director Jack Fascinato, costume designer Joe Lockwood, and producer Beulah Zachary to discuss the basic premise for that day's program. The popularity of the show stemmed from how it created its own unique world of make-believe. The characters were not caricatures, but rather well-developed, three-dimensional individuals with distinct histories, personalities, eccentricities and foibles. In the show's initial episodes, the Kuklapolitans were strong characters, but not individuals. In the simple banter between Allison and one of the "kids" (as Tillstrom, Allison and others referred to them), audiences learned more of their individual histories: where they went to school, their relatives, how an ancestor of Ollie's once swam the Hellespont and took in too much water and thereby drowned the family's fire-breathing ability, and about the time Buelah Witch was arrested by Interpol for flying too low over the United Nations building. The leader of the troupe was Kukla, a sweet-natured and gentle clown who was something of a worry-wart. Oliver J. Dragon (Ollie), atypical of traditional puppet show dragons, was a mischievous, one-toothed dragon with a penchant for getting into trouble. Other members of the Kuklapolitans included grand dame Madame Ophelia Oglepuss, Stage Manager Cecil Bill (who spoke a language comprehensible only to the other Kuklapolitans), Colonel R.H. Crackie, a debonair Southern gentleman, floppy-eared Fletcher Rabbit, Buelah Witch (named for producer Beulah Zachary–with the intentional misspelling), Ollie's mother Olivia Dragon and niece Dolores, whom audiences saw grow from an noisy infant into a typical teenage dragonette, and many others. Their human qualities endeared them to their audience. It could be said that Allison acted as "straight man" to this cast of characters, but her role was much more. A quick wit in her own right who could maintain the pace set by Tillstrom, Allison served simultaneously, according to Tillstrom, as "big sister, favorite teacher, baby-sitter, girlfriend and mother." Allison was equally responsible for adding to the characters' histories. She was the first to mention Ollie's mother and prompted Tillstrom to create the character for a future show. The Kuklapolitans returned briefly for one season in 1961 for a daily five-minute show without Fran Allison. Kukla, Fran and Ollie was revived for two season (1969-1971) for PBS, and from 1971 to 1979, the Kuklapolitans and Allison served as hosts for the Saturday afternoon CBS Children's Film Festival. The characters continued to appear in syndicated specials in the early 1980s. In all of these series and formats, the essential elements of the original series remained the same. In its initial ten year-run, Kukla, Fran and Ollie received a total of six Emmy nominations for Best Children's Program but won only once, in 1952. It was awarded a Peabody as the outstanding children's program of 1949. 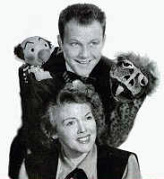 In a tribute to creator Burr Tillstrom, co-worker Donald Corren (Chicago, July 1986) said, "The acceptance of television puppetry as a form of entertainment and communication exists because Kukla, Fran and Ollie was as much a part of the original television vocabulary as were 'station identification,' 'the six-o'clock news,' or the chimes that identified NBC." Because the Kuklapolitans were such vibrant characters, Tillstrom specified in his will that they are never to be put on display inertly unless they are moving and speaking as he intended them to be seen.